Precise control of product level in a tank, reactor, or other vessel is important in many applications. To provide good control, accurate measurement is essential. This section introduces the concepts and terminology of level technology devices and how they work, as well as how various other material properties (e.g., volume, density) can be determined from a level measurement. Level measurements are typically expressed in terms of feet or meters. Level may also be given in terms of percent full or percent of measured span. Level measurement indicators enable an on-site level check. Indicators require the operator to interpret the measurement and take the appropriate action. Systems with level measurement indicators are referred to as open-loop control systems. Indicators are also frequently used to help calibrate automatic control systems. Automatic control systems, or closed-loop systems, are able to control level in a vessel electronically. A level-measurement device, combined with a transmitter, generates an electronic control signal that is proportional to the level in the vessel. The signal is received by a controller that operates other devices (e.g. valves or pumps), which, in turn, control the amount of product flowing in and out of a vessel. Automatically controlled vessels may also include level measurement indicators. A tank gauging system is used when the user has applications where raw materials enter a plant, are stored in intermediate tanks, or leave the plant as finished goods, and therefore require an inventory management or custody transfer system. These tanks are typically 33 to 100 ft (10-30 meters) in height. Some exceptions, such as additive tanks, are smaller. Accuracy requirements are high, in the order of 1-3 mm. • Some large raw material and product storage tanks that are found in chemical, asphalt, power plants and airport fuel depots. The tank gauging system usually includes temperature, pressure and water bottom measurements in addition to level. Communications equipment, computer hardware and software are also included in the system solution. The measurement values are used to calculate net volumes for custody transfer (commercial and legal purposes), inventory calculations, operational and safety purposes. The results of the measurements are often used for billing purposes and must be highly accurate, repeatable and reliable following industry standards such as API MPMS 3.1B and OIML R85, or national accuracy standards. The Rosemount tank gauging system complies with these international standards and is also approved in many countries for accuracy by governmental authorities, with an instrument accuracy of +/-0.5 mm. Level transmitters are used within the plant. The level measurement is usually an independent input to a control system. Measurement reliability and repeatability is more important than highly accurate readings. The accuracy requirement is typically in the range of 5-10 mm. Continuous level transmitters are found in all industries including chemical, oil & gas, power, refining, pulp & paper, mining, pharmaceutical, food & beverage and other process plants. The majority of these tanks have a wide variety of sizes and shapes, but most are less than 60 ft (18 m) high. Many of the level applications may not be directly in the vessel, but rather in bypass chambers located outside the vessel next to the level area of interest. Being inside the plant process, these applications can be quite varied in terms of difficulty of the measurement. Intermediate buffer or settling tanks are some of the easier applications. Measuring inside a chamber is another common application, while batch reactors and tanks where the product is mixed or agitated offer other challenges. Switches are often used in conjunction with continuous level measurements for single point high level and low level alarms. However, they can also be used alone to simply indicate a full or empty state. Size and space constraints as well as the application conditions will determine the choice of electronic or float switches. Understanding the different needs a user has makes the selection between a point/continuous level measurement and a tank gauging system easier. In a contacting measurement, part of the measurement system is in direct contact with the contents of the vessel. Examples of contacting measurement techniques include guided wave radar, floats and dipsticks. In a non-contacting measurement, no part of the measurement system directly contacts the contents of the vessel. Non-contacting methods are preferred when the measured fluid is especially abrasive, solidifying, viscous, dirty or corrosive. A top-down measurement poses less potential for leakage and enables level measurement devices to be installed or removed without emptying the tank (e.g. radar gauge). Top- down measurements may or may not contact the process fluid. Level devices that use pressure transmitters are bottom-up measurement systems. A bottom-up measurement typically contacts the process fluid (e.g. DP level). Direct measurement indicates that the level is measured directly. For example, when you use a dipstick to check the oil level in your car, you are making a direct measurement. A direct measurement is independent of any other process parameters. 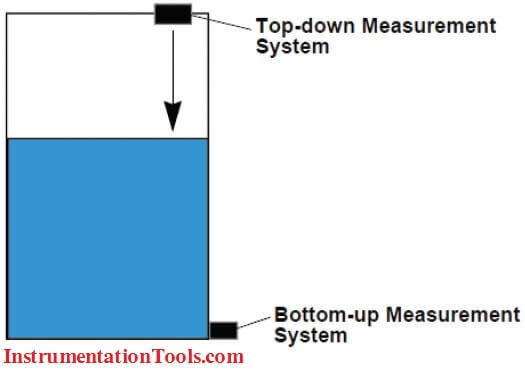 Indirect measurement, also known as inferred measurement, indicates that a variable other than level is first measured and then used to determine a level measurement. For example, pressure transmitters use mass and the fluid’s specific gravity to calculate level. Density is the mass of a material per unit of volume. Density is often expressed in terms of pounds per cubic foot (lb/ft3) or kilograms per cubic meter (kg/ m3). Specific gravity is often used to describe the density of a material compared to the density of water. Specific gravity is the ratio of the density of a material to the density of water at a common reference temperature. Water has a density of 62.43 lb/ft3 (1 g/cm3) at 39.2 °F (4 °C). Glycerin, a compound often found in soaps, has a density of 78.66 lb/ft3 (1.26 g/ cm3). At the same temperature, therefore, glycerin’s specific gravity is 1.26 (78.66 ÷ 62.43). Volume is the space occupied by a quantity of material and often the level is used to calculate the volume. Volume is typically expressed in gallons, liters, cubic centimeters, cubic feet, or barrels. Volume is the measurement most commonly derived from level. Volume is usually determined by first measuring the level in a tank and then calculating the volume based upon the tank geometry. Many level-measurement devices store the level/ volume relationship for common tank geometries in their electronic components, which enables them to calculate a direct volume output. In other cases, the volume may be calculated in a Distributed Control System (DCS) or a programmable logic controller (PLC) or determined from a look-up table that relates level to volume. The relationships between level and volume for several common tank shapes are shown overleaf. Calculating volume from level and tank geometry provides a volume measurement accurate enough for most users’ needs. However, in some instances, the geometry of the tank may be irregular, which makes it nearly impossible to model the relationship between level and volume mathematically. In such cases, volume must be determined from the level reading through the use of a strapping table. A strapping table is a look-up table that relates level to volume for several discrete points in a tank. 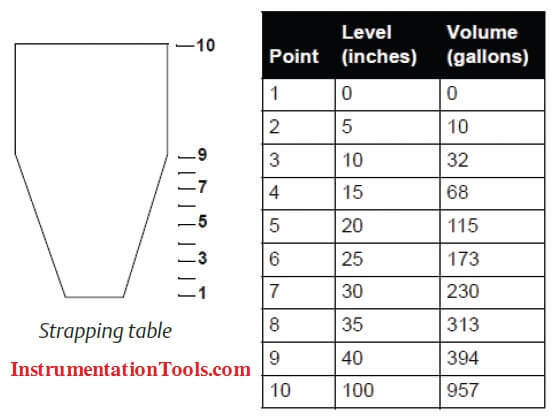 Strapping tables are usually derived by adding a known volume of product to a tank and then measuring the level of product that corresponds to that volume (manual strapping). The volume and level measurements are recorded in a strapping table. Then, when a volume measurement is required, level is measured and looked up in the strapping table to find the corresponding volume. Strapping tables can just be a few points to accommodate a tank shape or they can be hundreds of points. Larger numbers of points are used with larger tanks that tend to bulge when filled. If a measured level falls between two points in a table, volume is determined by interpolating the two points. Typically, strapping tables have a higher concentration of points in tank regions where the relationship between level and volume is not linear. Mass, the amount of matter an object contains, is often equivocated to weight. Mass is typically expressed in terms of kilograms, grams, tons, or pounds. Mass is unaffected by temperature. Thus, 60 lb (27.2 kg) of oil at 50 °F (10 °C) is still 60 lb at 86 °F (30 °C). However, the overall volume of the oil may change due to expansion. Some level-measurement devices measure mass directly (e.g. load cells). An interface is the boundary between two immiscible (incapable of being mixed) fluids with different densities (e.g. oil and water). An interface measurement finds the boundary between two liquids stored in the same tank, each with a different density. For example, when oil and water occupy the same vessel, the oil floats on top of the water. The interface between the two fluids is the upper level of the water and the lower level of the oil. Interface is often used when a user has two fluids in a tank and wants to pour off only the top fluid. The interface measurement indicates when to stop. Interface measurement can also be used in a separator, where the interface is used to control the flow of the top and bottom fluids out of the vessel with minimum contamination.